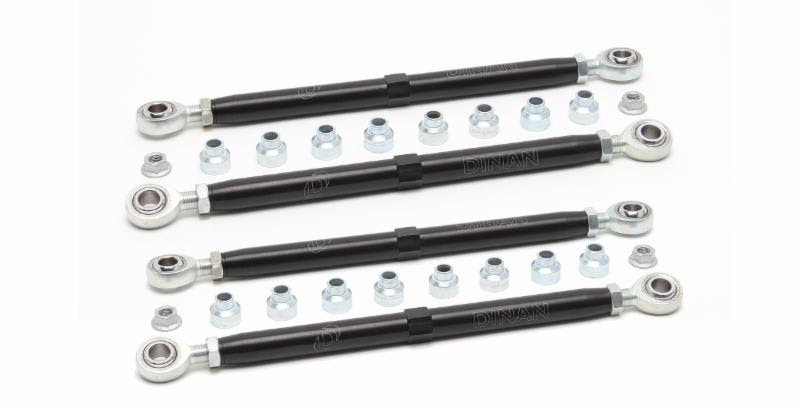 Dinan’s high performance Rear Suspension Link Kit adds precision and predictability at the limit. The stock rear toe link is built with rubber bushings and a curved forged alloy rod which can easily flex. During hard acceleration this flex allows the rear wheels to have excessive toe change under hard acceleration and braking. All of this flex in the stock toe link causes the car to be unstable. Dinan stops the flex by replacing the rubber bushings with Teflon coated machined steel rod ends and the OEM curved bar with a straight billet aluminum rod, thus adding stability. The Dinan rod-ends incorporate left and right hand thread, which allows quick and accurate toe adjustment that is tough to achieve using the stock system. Like the rear toe links, the stock front trailing links also incorporate rubber bushings. Flex in these bushings allow the rear wheels to behave sloppily under heavy loads. Dinan adds precision by replacing these links with billet aluminum rods and Teflon coated machined steel rod ends. These front links are not adjustable, because there is no need to doing so.